Which Kenmore upright freezer is best? Well, it depends on your needs. But with 15 Kenmore upright freezer models to choose from, you'll likely be spoiled for choice. So we suggest you narrow down your search by size, color, manual defrost vs. frost free, quick freeze option, ice maker, electronic controls, lockability, energy efficiency or bestselling model. Only to find—to your utter dismay—that it was too wide to pass through the front door. Or that there wasn't enough floor space or headroom in its designated spot. If a freezer is even just 1/4 an inch too wide, it's of no use to you. And because freezer dimensions are given to the last fraction of an inch, there really is no excuse. If you are a looking for a compact upright freezer, the 5.1 cu. ft. Kenmore 29502 is right up your alley. It measures 21” W x 22-5/8” D x 49-5/8” H, making it easy to niftily slip into the narrowest of spaces. Although it weighs only 72.6 lbs, it can hold up to 194 lbs—nearly 3 times its weight. And, because it has a pair of front wheels, it's possible to move it around house without any weightlifting. If you feel a slightly larger freezer is more ideal, it's worth taking a good look at the Kenmore 29702 which has a storage capacity of 6.5 cu. ft.
Its dimensions? 22” W x 24” D x 56-6/8” H.
It also has rolling wheels, making it easy to push into tight spots without hurting your knuckles. These 7 freezer models sit on the next rung the size scale. The 12.1 cu. ft. Kenmore 28262 measures 28” W x 31-1/8” D x 60-1/4” H on the outside and stores up to 400 lbs of frozen food (frost free, mechanical controls). All models have external dimensions of 28” W x 31-1/8” D x 60-1/4” H.
The 13.7 cu. ft. Kenmore 28452 (white, frost free, electronic controls, security lock, temperature alarm). The 16.6 cu. ft. Kenmore 28732's external measurements are 32” W x 29-1/8” D x 65-7/8” H and a shipping weight of 191 lbs. Its feature set includes frost free defrost system, mechanical controls, security lock and adjustable legs. The 16.7 cu. ft. comes in standard and Elite finishes. The outside dimensions for the larger of the models is 32” W x 29-1/8” D x 65-3/4” H.
The Kenmore Elite 28712 that is the luxurious alternative to the standard model (white, frost free, electronic controls, security lock, temperature alarm, energy efficient). If you are looking for a large upright freezer to complement your oversize kitchen, you'll be pleased to learn that Kenmore offers a choice of one 18.7 cu. ft. model and five 20.6 cu. ft. models. The 18.6 cu. 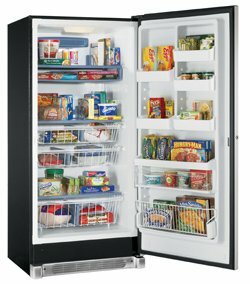 ft. Kenmore Elite 44753 is a frost free, stainless steel built-in all freezer, with electronic controls, bright LED lighting, and adjustable glass shelving. It's also Energy Star qualified. Its dimensions are 32” W x 26-1/3” D x 71-1/2” H.
While virtually all the 20.6 cu. ft. Kenmore uprights measure 32” W x 31-1/8” D x 71-1/4” H, they sport different feature sets nonetheless. Kenmore 28052 (frost free, electronic controls, temperature and door ajar alarms, security lock). In the freezer world, the rainbow spectrum is white, stainless steel and black, period. White is the color of choice if you are a proud clean freak. To their credit, white appliances are guaranteed to add a squeaky clean look and feel to your kitchen. A welcome bonus is that white appliances are almost always in style. This fact is lost on the makers of Kenmore freezers, because you have 10 white upright models—that range from compact to large—to choose from. 20.6 cu. ft. Kenmore 28052. Either stainless steel (black cabinet) Kenmore upright freezer will lend a contemporary air to your kitchen. It has to be a reasonably large kitchen though, because both freezer models are outsized. And if you place a premium on high-end appliances, you'll be pleased to learn that both the stainless steel models are part of the exclusive Kenmore Elite range. While the 18.6 cu. ft. Kenmore Elite 44753 is a built-in all freezer, the 20.6 cu. ft. Kenmore Elite 28093 is a freestanding freezer. Black is still trending in kitchens and a black freezer is great for contrasting light cabinetry. 20.5 cu. ft. Kenmore Elite 28099. Manual defrost freezers must be manually defrosted periodically when the ice builds up. While many find this tedious, homemakers may enjoy this intense workout. Cubic foot for cubic, manual defrosts cost considerably less than frost free freezers. 20.6 cu. ft. Kenmore 28042. Frost free freezers freeze food without forming ice. Because of this, frost free (auto defrost) uprights are fast gaining popularity. 20.6 cu. ft. Kenmore Elite 28093. It speeds the process by dropping temperatures rapidly in order to lock in the juices, flavor and color. 20.6 cu. ft. Kenmore Elite 28093 (stainless steel). An ice maker makes far more ice than an ice tray, in a much shorter time. And it saves you money too, as you don't have to buy ice from the store. So if you love to host, or put ice in everything you drink, buying a freezer with an inbuilt ice maker is a wise decision. So which Kenmore uprights have inbuilt ice makers? Only the 18.6 cu. ft. Kenmore Elite 44753 built-in all freezer. Compared to mechanical controls, electronic controls make it easy to set temperature and alarm thresholds with precision. An LCD display is the hallmark of electronic controls. The 20.6 cu. ft. Kenmore 28052. 20.6 cu. ft. Kenmore Elite 28099 (black). The Energy Star label is awarded by the Environmental Protection Agency to appliances that surpass the federal government's stringent standards for energy efficiency. You get cost savings (thanks to lower energy consumption) and a healthful environment (thanks to less pollution because less energy is consumed). 20.6 cu. ft. Kenmore Elite 28093 (stainless steel) consumes 691 kWH of electricity each year, working out to an electric bill of $74 or just $6.17 per month. A freezer is a major appliance in many ways. On average, a unit costs several hundred dollars. And unlike a shoes or a bad , you can’t easily return it to the store. It’s therefore absolutely important to pick the best upright freezer for your needs. 16.7 cu. ft. Kenmore Elite 28712. All the Kenmore uprights come with a one year limited warranty. This means that within 12 months from the date of purchase, Kenmore will replace any defective parts and remedy poor workmanship provided these existed at the time of purchase. Kenmore upright freezers are part of the Kenmore home appliances range that is sold exclusively through Sears' retail stores and select Kmart locations. So, you won't get them anywhere else.